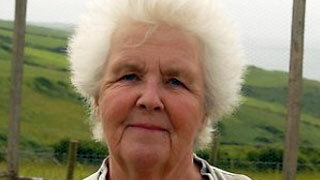 Stephanie Cole, as Aunt Joan in Doc Martin. The mention last week of Stephanie Cole in the Open All Hours revival, Still Open All Hours, prompted a long time Afternoon Tea fan to enquire as what Ms. Cole had been up to lately. It appears that since leaving Doc Martin in 2009, the recently turned 73 year old actress has been keeping very busy and not just on television. Cole went straight from Doc Martin to recording a radio situation comedy series for BBC Radio 4 called Cabin Pressure. In it, she played a divorcee who starts her own charter airline, crewed by an unusual assortment of characters; one of whom was played by Benedict Cumberbatch (Sherlock). The show, which was first broadcast in 2008, ran for four series until 2014. While recording it, Cole also had a major role in the 50 odd year old soap opera Coronation Street. Playing her "love interest" in the show was American actor Robert Vaughn (Hustle). Cole's departure from Coronation Street, after just two years, was quite sudden, the reason given being "owing to the death of a close family member", but even if that hadn't happened she would not have stayed around the street much longer. "I'm terrible", explains Cole, "you see. I'm a little bit like a fly - I like to flit hither and thither!" Rarely she says does she appear in more than four series of a television show. After Coronation Street, Cole returned to the stage in a touring play called This May Hurt A Bit, about the workings of the National Health Service. As a child, Cole remembers when the National Health Service was first introduced. She particularly remembers her "parents' relief when they realized that they could go to or call a doctor and know that they didn't have to count the pennies before they did it." Cole's role in the play was that of an elderly stroke victim. Her performance received excellent reviews, which isn't surprising as the stage is where Cole first started out. She was just 16 years old when she auditioned for, and was accepted at, The Bristol Old Vic. She later returned there as a teacher, when she was struggling to make it in the acting profession. That "dry" period only lasted a year though and it wasn't long after that Cole got her first major television role in a series called Tenko. From then on it's been non-stop employment. 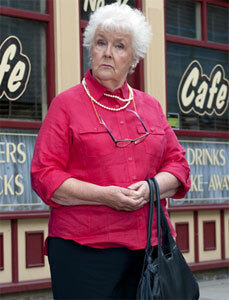 I'll be back with more on Stephanie Cole next week. In the meantime, if there's an actor or show you'd like to find out more about, feel free to drop me a line.